Zita Cobb is the founder and Innkeeper of the Fogo Island Inn, and CEO of Shorefast a registered Canadian charity. 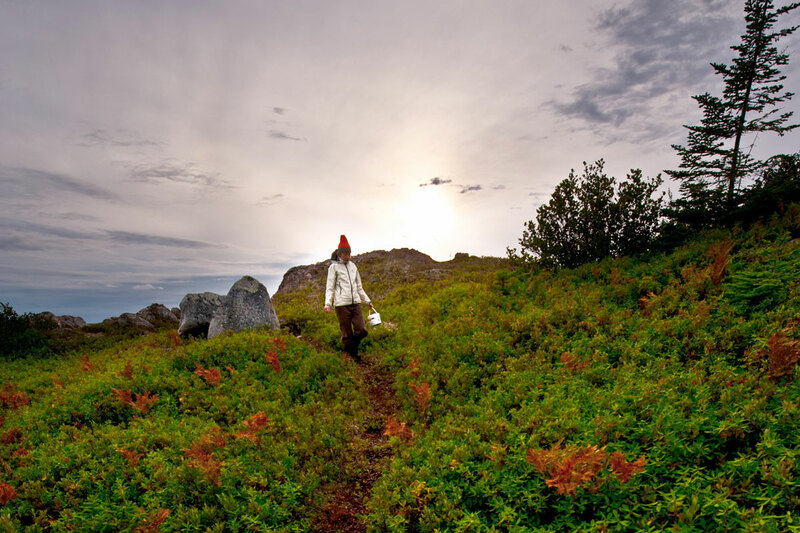 Growing up on Fogo Island, Zita developed a deep belief in the inherent value of place and respectful relationships with nature, culture, and community. Zita’s goal was to leverage an initial investment to create culturally rich, community-owned economic assets. In pursuit of this objective, Zita established Shorefast, a registered charity of Canada that employs business-minded means to achieve social ends. Quiet Luxury; A member of National Geographic Unique Lodges of the world, Travel Leaders, Ovation. Social enterprise and a community asset. Opened in 2013, the Fogo Island Inn was commissioned by Shorefast, a registered Canadian charity and designed by Newfoundland-born-and-raised architect Todd Saunders, as a direct response to a pressing need to find new relevance for traditional knowledge and ways. 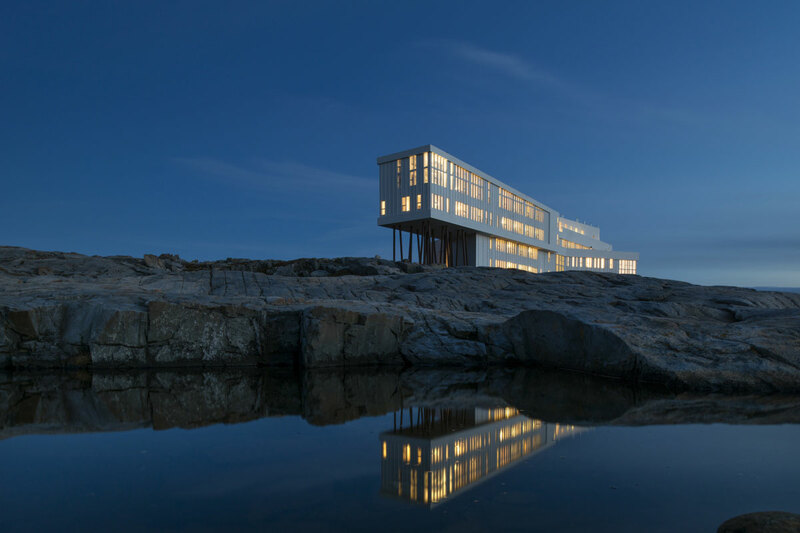 Fogo Island Inn is a 100% social business with all surpluses returned to Shorefast for reinvestment in the community of Fogo Island. 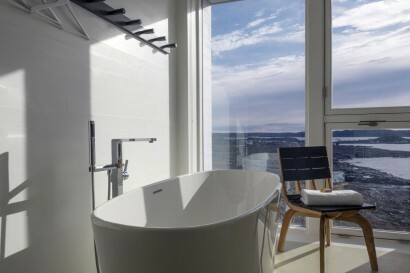 The Inn has quickly garnered an international reputation for exceptional, embodied, place-specific hospitality and bold, thoughtful, humanistic contemporary design. Fogo Island Inn stands out, yet it remains distinctly of the place. 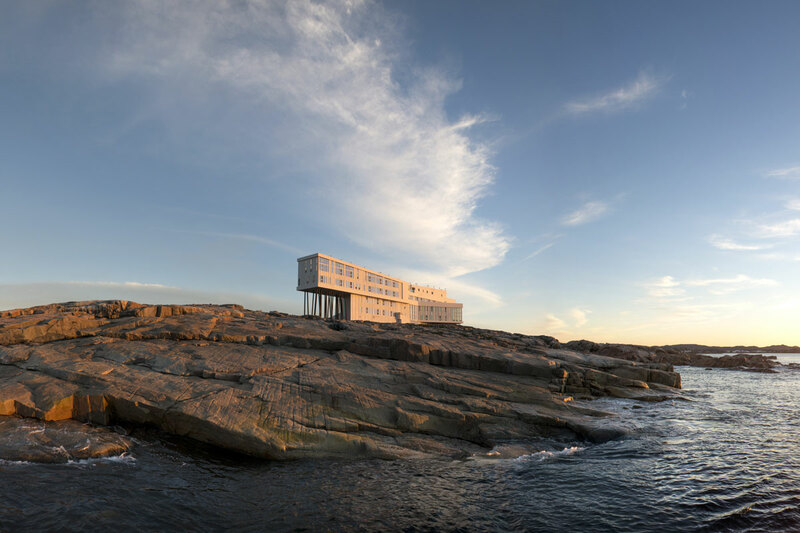 In a time when rural communities struggle for relevance and even survival, Fogo Island Inn was an opportunity to use design as a means of fortifying culture and place, while at the same time enhancing the economic prospects for this singular island community. There are no investors seeking a return, and there is no private gain. Established in 2013, the Inn is subject to cyclical inspections, repairs and soft refurbishments. 2018. Neighbouring function space added. All guests receive a half-day Island Orientation to the Island’s culture and still wild world, accompanied by a Community Host. All meals and use of the Inn’s facilities are included. Building on the legacy of local craft traditions, nearly all of the furniture and textiles of the Inn were handcrafted by local craftspeople, in collaboration with an international roster of visiting designers. Located off the Northeast Coast of Newfoundland, Canada, Fogo Island is a remote yet accessible outport community situated along the Labrador Current in Iceberg Alley. The Island is bounded by the rugged shores of the North Atlantic, the most powerful ocean on the planet. Fogo Island is big and small. Big enough to be interesting, yet small enough to know. 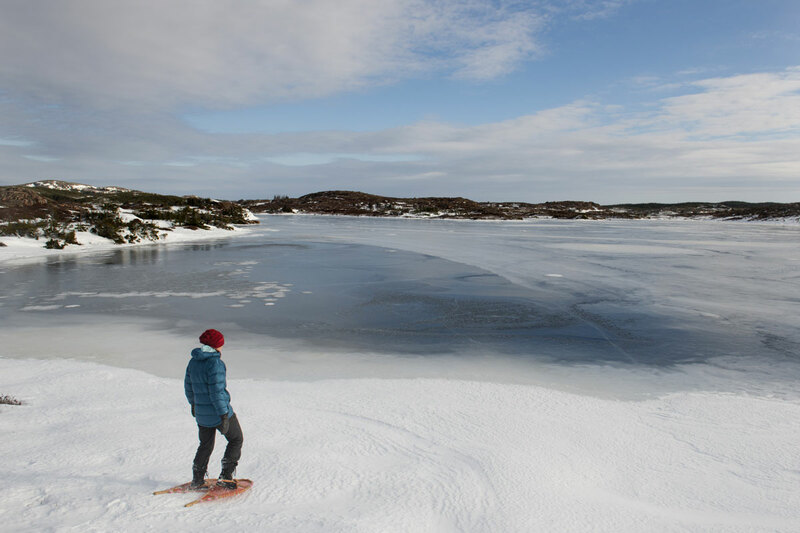 The Island’s Seven Seasons consist of warm summers, snowy winters, a spectacular ice season, hopeful spring, June’s trap berth season, bountiful wild berry picking in fall’s berry season, and a temperamental late fall. Whichever season one chooses to visit in, there are always a myriad of things to do and see from pond skating and ice fishing in the winter, to hiking over 14 trails in the summer and travelling through barrens and bogs carpeted by dozens of varieties of edible berries in berry season.. 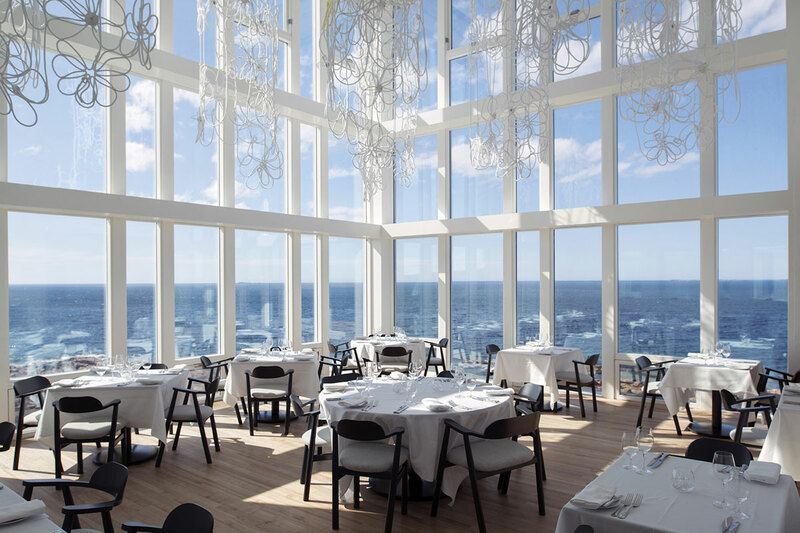 The globally-acclaimed contemporary architecture of Fogo Island Inn reflects the four-centuries-old vernacular structures and design aesthetics found on the Island. It is a place that is at once old and new. 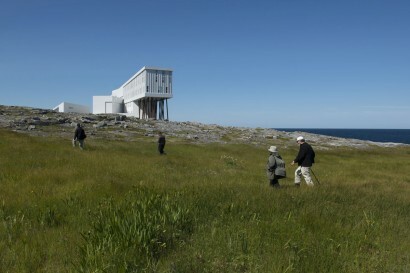 Four contemporary artist studios designed by Newfoundland born architect Todd Saunders are spread across the Island. Family Friendly. Family-sized suites are available. All stays include a half-day island orientation with a Community Host and use of the Inn’s facilities. A three-night minimum applies to stays in June, July, August & September. All other bookings require a two-night minimum stay. Total 13, 350 sq ft, Floors 1-3. Intimate nests for up to two persons on the 1st, 2nd and 3rd floors; all with stunning views of the Atlantic Ocean. All Labrador Rooms have walk-in showers and some have wood stoves. Total 9, 425 sq ft, Floors 3-4. 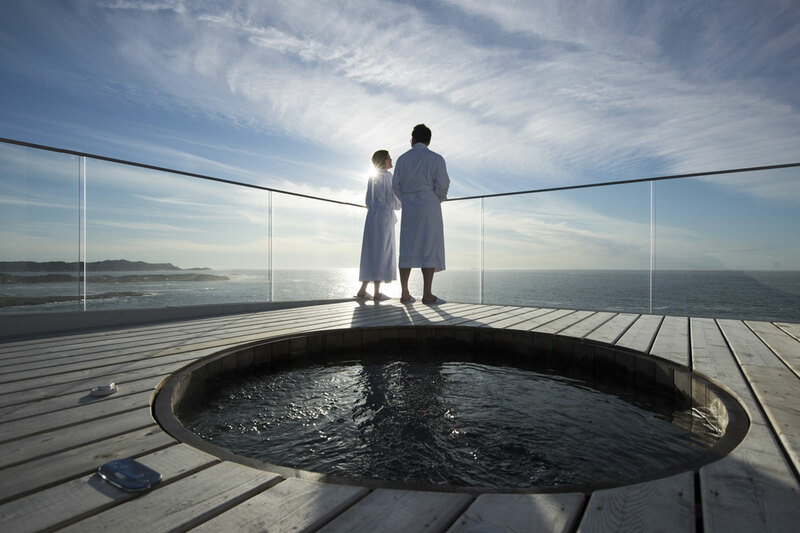 These rooms are for up to two people and are located on the 3rd and 4th floors, with impressive views of the Atlantic Ocean. The 3rd floor Newfoundland rooms have a bath, shower and wood stove. 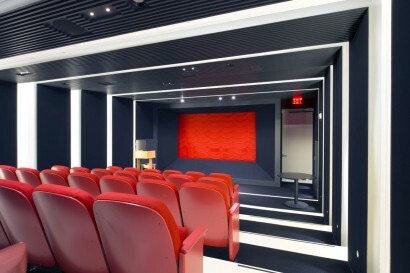 The soaring ceilings and drama of the 4th floor rooms give a deep sense of oneness with the sky. The 4th floor Newfoundland rooms have a walk-in shower and wood stove. Total 3, 800-850 sq ft, Floors 3-4. 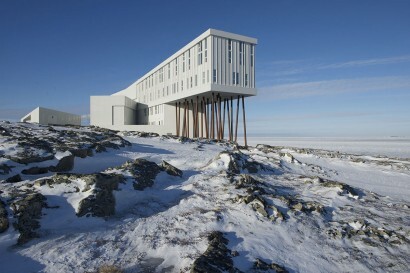 Fogo Island Suites accommodate up to two persons. 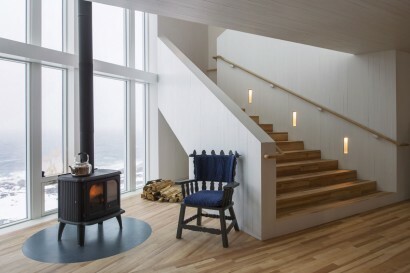 Each suite is as spectacular and varied as Fogo Island itself, with stunning views of the Atlantic Ocean. All have a bath, walk-in shower, and wood stove. Some have an extra washroom. Our Fogo Island Family Suites are perfect for families of up to 4. 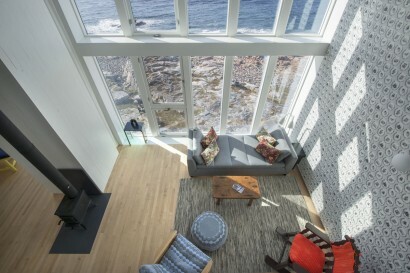 Each suite is as spectacular and varied as Fogo Island itself, with remarkable views of the Atlantic Ocean. All have a bath tub, walk-in shower, and wood stove. Some have an extra washroom. Total 1, 1100 sq ft.
A sublime outport sanctuary and a world unto itself. The Flat Earth suite is oriented to the east and is a distinctive two-storey corner with commanding views of the Atlantic Ocean to the north, east, and south. It is a singular space within the Inn and is suited for up to three persons. This 1,100 square foot retreat features a lofted sleeping quarters and includes a walk-in shower, soaker tub, wood stove, and extra washroom. The Dining Room seats 48 guests. 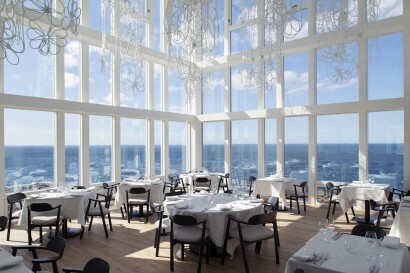 At Fogo Island Inn, the talented culinary team, led by award winning executive chef Jonathan Gushue on traditional outport cuisine and creates inspired classic dishes with local ingredients harvested from the island’s peaty soils, foraged from the salt-sprayed shoreline and wild-berry patches, fished from local waters, and raised and hunted regionally. The lounge and bar area features a signature line of Newfoundland cocktails which play off of longstanding traditions and combine them with new techniques. In the evenings, the lounge and bar area are regularly visited by local musicians singing traditional folk songs accompanied by gentle guitar or accordion. Guests are welcome to pick up the Inn’s guitar for a quick strum or take a peek at the stars through the lounge telescope. The second floor Gathering Hall is multi-functional and has been engaged for every type of event, from concerts to weddings to executive retreats. Offering similarly stunning ocean views to those of the Inn’s guest rooms, the Gathering Hall is a great place for talking, thinking, collaborating and celebrating. • Traditional Newfoundland Boil Up’s (extra charge).